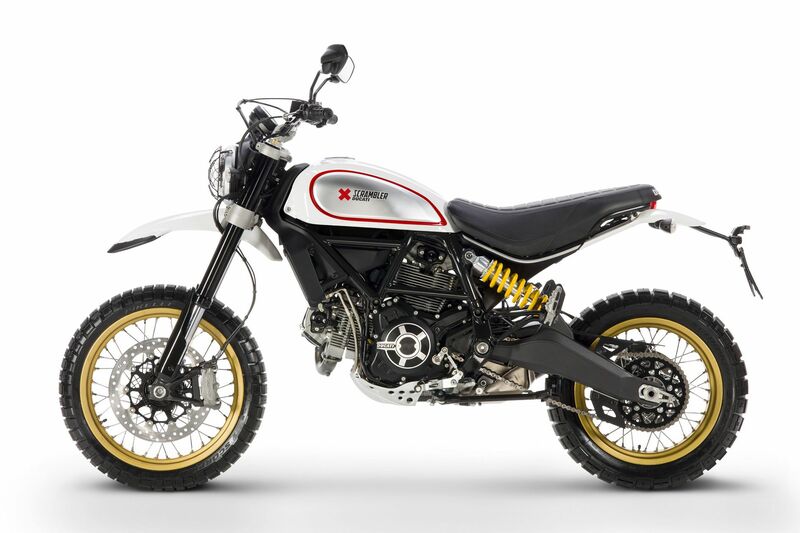 I've never been a huge fan of the Scrambler models, but I can't believe that there aren't any posts about this new model. I like this one, especially in the white ! duc96cr and jimmyjojo like this. The Desert Sled and the Cafe Racer are my favorite Scramblers to date. They really take the Scrambler to it's limits (Something the Flat Tracker and the Urban Enduro failed to). The new DS Scrambler excites me more than any other model from Ducati at the moment. I think they nailed the design brief. Air cooled, simple tech, properly modified suspension and swingarm, I hope a whole "scrambler adv" movement springs up from this bike, I would much rather tour on this than the new Mini Multistrada. Keep it simple and fun, I don't want 3 different riding modes and all that other BS, nice honest donk, good brakes and some decent luggage, maybe a screen, now lets go have some fun. Edit: Did i mention what a sucker I am for Gold spoked rims on any bike! ducvet and Florida lime like this. Man i wish i held out and got one of those!!! Yes It has my interest as well, I've a triumph tiger xc that does general duties so this may be a good alternative. I was thinking it may be a bit lighter though but seems only about 10kg lighter and will carry a lot less fuel. interesting to see what it's like in the real world and not my imagination. 1199 Base - TTX & Ohlins forks with NIX 30mm - DP rear sets - Lithium battery - OZ BSB Wheels - Akra Titanuim Full Exhaust - Blip Box Pro - Rapid Bike Evo. I haven't thought about buying a new bike in years, this bike has me thinking it might be time. Yup, great job, Ducati. I like that! It looks very lean, how can it weigh 456 lbs? Can cut 15 with an exhaust and delete, but it will need a spark arrestor. found out it weighs much more than my Hyper 1100s.